This week we celebrated Science Week 2019. We really enjoyed sharing our work with our parents. Thanks to all parents who were able to come in. Year 4 have been completing coursework to go towards our O.W.L exams. This week we made three flying objects, a plane, a spinner and a glider. We looked closely at each design and using our knowledge of air resistance, we made predictions about which design was the best. We really enjoyed testing them out outside on a rather windy day! The Hogwarts Express steamed into our library over the holidays, much to the delight of Year 4 who are reading Harry Potter this term. Who will win the Quidditch match I wonder? The Romans and Celts took over year 4 today- don't they look fabulous? On the first day of term, year 4 were amazed to discover an “iron age burial” here on the school grounds. Unearthed by Mr Thomas during routine maintenance, the remains were quickly identified as ancient and the archaeologists were called in. Pupils have been challenged by the archaeologists to find out more about the people living in Britain at the time of the burial, the Celts and the Romans. The children are continuing to find out about many different aspects of life in Roman Britain and we look forward to more updates on the “skeleton” from the experts. We have been holding our inter house competition this week in Year 4; we competed in a hockey tournament. There were some good passes and some great defending. Well done to all of Year 4 for being such good sports! 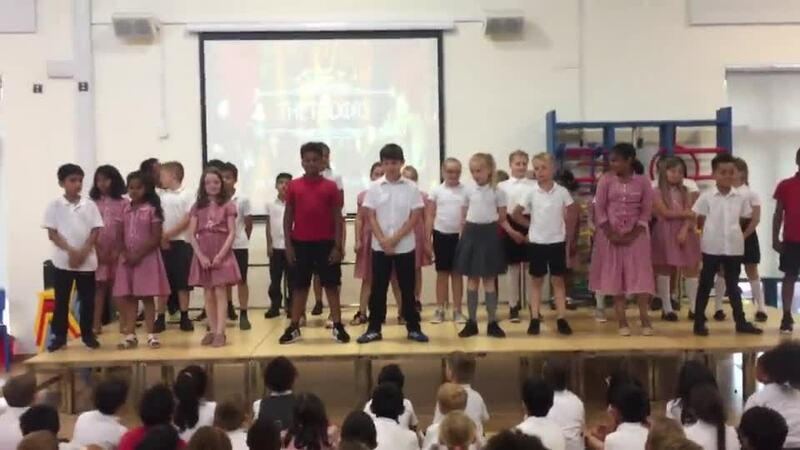 As part of the Year 4 Spanish topic, we have been learning the Paso doble. The Paso doble is a dramatic interpretation in dance of the matador facing a bull in the traditional bullring, and originated in southern Spain. Paso doble translates as 'two step', and developed from the march at the start of a bullfight. On November 13th Year 4 had the opportunity to climb on the climbing wall. All of the children were eager to try a new experience and many managed to climb all the way to the top. This term our topic is Spain. We will be learning about the food, culture, architecture and landscapes of Spain. We will be cooking Spanish food, creating art based on the artists Joan Miro and Antoni Gaudi and creating a dance, based on Flamenco, to express an aspect of Spain. At the heart of our topic is our class text “Toro! Toro!” by Michael Morpurgo which tells the story of a boy and his calf, destined for the bullring, against the backdrop of the Spanish civil war. Year 4 are excited for Comicon! Can you guess what we’re making? Year 4 loved the Inter house competitions today! Children in year 4 have been sewing their own Harry Potter House badges. World Book Day and Snow today- does it get any better? This week in topic we have been looking at the link between melting and cooling with regards to volcanoes. This week in English we have been looking at instruction writing. We have used our knowledge to help us follow a set of instructions to make a papier mache volcano. We have been learning about fronted adverbials. We have experimented with changing the word order of a sentence. This week year 4 have used illustrations from our class text Escape from Pompeii to inspire our artwork using line for a different effect. As part of Celebration and Aspiration Day year 4 had great fun with athletics gold medal winners Jason Gardener and Ryan Scott. Year 4 really enjoyed their first PE lesson in our new school hall. We especially enjoyed using our new climbing frame. On Friday 9th May year 4 enjoyed a fabulous educational visit to the sculpture trail in the Forest of Dean. As well as discovering a number of sculptures by world renowned artists, the children also identified spring flowers and compared the mini-beasts found in different habitats. Inspired by what they had seen and earlier work on the artist Andy Goldsworthy, the children created forest art from found materials. In science we have been learning about how sound is made. We investigated this question by using different instruments. We used a guitar, penny whistles, a tambour, tuning forks and a glockenspiel. We particularly focused on how to make high and low sounds. In Year 4 we have been learning about how sound is made and how it travels. We made ‘telephones’ out of paper cups and string. We took them out in the playground and tested them. Some worked better than others, the ‘telephones’ with the longest piece of string worked the best, we could hear our partner from quite a distance! During guided reading this week we read the Chapter entitled Halloween from Harry Potter and the Philosophers stone. During this chapter Hermione gets trapped in the girls toilet with a troll. We used this event as a stimulus for this week Art lesson and drew our own trolls. We love reading at CPJS especially in 4S. On Fridays as part of Guided Reading we are able to bring in books from home to share. Xavian bought in his collection of Beast Quest and Sea Quest books – as you can see he is quite a fan! Our topic this term in The Magic of Science. This week we made some ‘Orrible Ooze’. We used cornflower and some water. We then used our fingers to stir the mixture together. We focused on what happens when you tap the surface of the ooze firmly with your finger. We enjoyed the hands on practical science although we did get rather messy! Our Power of reading book in Term 4 is Harry Potter and The Philosophers Stone. We are looking forward to learning about the magical world of Hogwarts and finding out exactly what muggles are. Year 4 have been investigating the melting temperature of different solids. Year 4 pupils have been using Google Earth to locate volcanoes around the world. Some members of Year 4 were lucky enough to be involved with a writing workshop. We worked together all day to produce an adventure book. We used drama and description to help us write a page each that then came together to create the book. The reader is control of their destiny; at the end of each page they must make a decision on what to do next. We tested it on the whole school in assembly but unfortunately they came to a sticky end - twice! Who will be lucky enough to make their way through our cave adventure and find the treasure? Studying the wildlife and sculptures at the Forest Of Dean, Year 4 had a wonderful day creating their own artwork. Weren't they lucky with the weather? Some time ago,Year 4 were allocated a portion of the garden space at the front of school, and used it to plant some Broad Beans. Look how successful they have been. On Friday afternoon, just before the Heavens opened, Mrs Carey and four year 4 children went exploring local woodlands. Don't they look happy? Year 4 have been using watercolours to paint woodland scenes as part of their Woodlands topic. Year 4 animated the Troll scene from "Harry Potter and the Philosopher's stone. " In year 4 we have been investigating what changes the pitch of a note. We had a series of different investigations to carry out. We had bottles with different amounts of water in, which we blew into. We loosened and tightened guitar strings to spot the difference. One of our favourite activities was blowing into different sized recorders. In Year 4 we have been investigating the properties of different materials. We are finding out which material is strongest. Look at these children that read 3+ times at home. They will now put their token in box for a chance to win a book! Well done to you all and keep reading! "This week, on Tuesday Lucia, Edie, Annie and Nixie went to a Maths Competition at Redmaids Junior School. When we got there, we were put into pairs. Edie and Nixie, and Annie and Lucia. We worked hard and solved difficult mathematical problems together. We had a few rounds. One of the things we did was called “dicey dicey”. “Dicey dicey” is where there are a number of dice on a screen and you had to add up all the numbers. We also did “make 24”. In “make 24” there were 4 numbers on the screen and you had to add, subtract, times or divide them without using a number twice, and without not using one at all. After we had solved all of the problems, we had delicious jam donuts (strawberry) with orange juice. We all had a great time and enjoyed the day!" Year 4 have been looking at mosaics and making their own. Click here to see the Powerpoint presentation they have made. In year 4 we have used two lines of symmetry to create repeating patterns. We were inspired by tiles from the Alhambra Palace in Granada. On 'No pens Wednesday', year 4 conducted a science investigation into melting solids. In year 4 we have been learning about solids, liquids and gases. This week we carried out a science experiment where we melted solids and recorded the melting temperature. We had to remember our safety instructions, such as wearing safety goggles, having long hair tied back, and using a safety lighter. It was great doing some practical science. We looked at the contrasting colours the artist used. To create our own pictures we used oil and soft pastels. As part of Black History Week, Year 4 made Carnival mask. work the Romans battled with the Celts in year 4. Children had designed and made their own costumes, then enjoyed performing a short play to the rest of the class and Mr Phillips. There was so much energy and enthusiasm, have a look at their photos! Today in PE Year 4 were getting ready for Sports Day! We are showing resilience by practicing our throwing skills using a range of missiles. We have thought carefully about when we release the missile and how to use our body weight to increase the power behind our throw. Over Easter, Year 4 have been collecting information and making posters in preparation for our Topic on Rome! Here are some of the posters and resources our pupils bought in to share with the class! Photos taken by Ahasch in 4W. Year 4 continued to enjoy Harry Potter as part of their World Book Day celebrations. Click on one of the photographs to start the slide show. ..Tuesday 10th February, the whole of year 4 clilmbed aboard a bright yellow magic bus which transported them to the World of Harry Potter. After a picnic lunch, everyone marvelled at the props and technology involved in making the films. There was a snitch hunt, and log books for house crest stamps. Wand lessons followed before a trip along Diagon Alley . Everyone was enthralled by the skills of the technicians and were amazed at how the characters and animals were created. Many children bought more of the Harry Potter books to take home with them, captivated by the author's imagination! Year 4 thought carefully and imaginatively about their own Mythical Creature creations! Harry Potter Night - a magical evening of potions, puzzles broomstick races and fun! Professor Dumbledore made a surprise visit today, bringing the sorting hat with him to choose which house the year 4 children would be in! As part of our ‘Could it be Magic?’ investigation, we have been looking at electricity and electrical circuits! The children in year 4 have now been swimming for 5 terms. It was difficult to single children out, but certificates were given to these children for their effort, ability or progress. 4W are looking at fractions during maths lessons! We have been investigating all the different ways fractions can be presented! As part of our Volcanoes topic we sketched volcanic landscapes. We then explored creating different textures using coloured paper to show the different surroundings. We have been looking at the eruption of Pompeii in ancient Italy. As part of our topic we looked at what people would have eaten at the time and learned how to make classic pizza toppings. We designed and made costumes so we could re-enact our diary entries from our Literacy lessons. Many of our pupils will be celebrating Eid over the next few days! Aisha, Talha, Zaynab and Manaal of 4W created a powerpoint to explain the celebration to their friends! In Year 4 we have been reading ‘Escape from Pompeii’. We are going to write a diary entry from the perspective of a main character. To prepare for this, we have been exploring characters’ feelings through role play so we can better describe them in our writing! Here are our re-enactments of the tragic day Mount Vesuvius erupted! 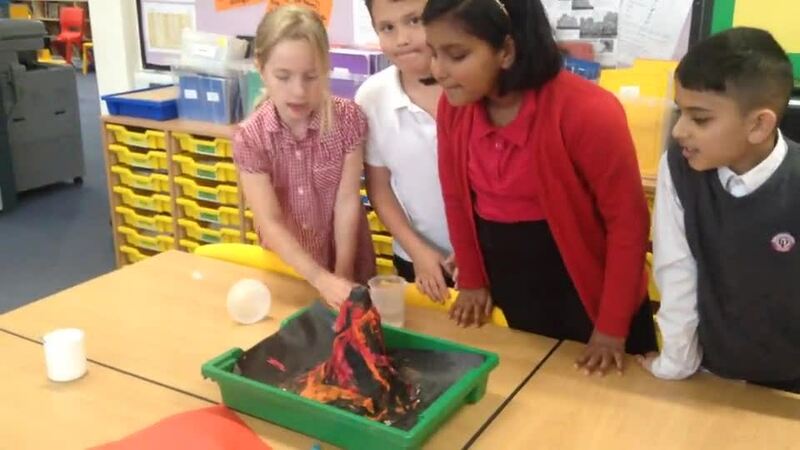 Alice and Lily made a volcano as part of our volcano topic. We used baking soda, vinegar and food dye to recreate a volcano errupting. It was terrifying! Tuesday 8th July we were visited by Eden Food's smoothie workshop. By pedalling really hard we made fruit juice! Year 4 visited Bristol Zoo last week. We had a great time learning more about the animals and their habitats. We saw some animals that Darwin saw on his journeys. The sunny weather made it even more enjoyable. Year 4 have been studying the Galapogos Islands as part of our ‘Darwin’s Discoveries’ topic. We have been looking at food chains and the sort of animals Darwin would have discovered on the Islands. One of our favourites was the giant tortoise! What we didn’t realise is that one of our very own explorers Alice Davis has her own tortoise! Meet Herman! Alice was kind enough to bring him to show us and he even made an appearance in assembly. We learned all about Herman’s natural habitat and how Alice cares for him and recreates it at home for him. Year 4 have are studying Darwin this term. As part of our topic we have been drawing flowers from our own beautiful garden in the style of Darwin himself! As part of Challenge week, year 4 made Tapas. The children brought some to the school office for us to share, they were delicious! 4A used our vocabulary knowledge to give French weather reports on different locations around the world. We researched the locations using the iPads and presented our reports to the class. As part of our Iron Man work, we have written descriptive openings and illustrated them. We thought about what would help he reader to imagine the setting and characters. On World Book Day we read a range of different books by significant authors. We then choose an extract of one of these books to dramatise. We enjoyed thinking about the characters and how to portray the emotions through our actions. To finish off our Castles project we had the opportunity to design and make some catapults. We thought about the best way to make a catapult using the materials available to us. We had to think about the best way to join the materials. Year 4 practicing their Happy Song dance! Year 4 have been learning about designing castles. We have learnt about the type of place someone would want to build a castle and create adverts to show what we have learnt. Year 4 have been circuit training this term. They have created their own training routines. They have enjoyed working out and getting even fitter! We have been studying the Caribbean this term. As part of this we have looked at the flowers that grown on the islands. We used hatching to shade our flowers and varied the shade by using different types of pencils. We also drew some flowers using oil pastel. We enjoyed creating different colours by using a variety of colours together. The children have been creating and performing partner balances in P.E. They have thought about using different levels of movement and a combination of asymmetrical and symmetrical balances. They enjoyed showing each other what they achieved. As part of studying the immigration into America through Ellis Island, the children took on the role of immigration officers and immigrants. They asked each other questions to decide if they would be able to settle in America based on the questions asked in the 1900’s. To begin year 4 we have set ourselves some targets that we would like to reach. We have thought about academic work and how we relate to others. We’re planning on having a great year! We have been creating our own royal portraits based on Norman portraits. We have printed photos of our heads and drawn the bodies with crayons. In year 4 we were learning about ratio. We did a practical lesson of making cocktails using orange juice and lemonade. We had to work out different ratios to make the cocktails. E.G. - 2:3 where 1 measure was equal to 100ml. ‘We really enjoyed this lesson as we able to taste the cocktails that we made. As part of our Caribbean project we thought about which Caribbean flavours we could incorporate into a biscuit recipe. We then made these biscuits in groups, designed packaging and made boxes for the biscuits. Feedback from our families who ate them was very positive! We have been enjoying our first harmonica lessons. We are becoming confident at knowing when to breathe in and when to breathe out and have learnt how to hold the harmonica properly. There are lots of different ways of making music with it and we have explored these. Here we are trying to keep beat with a percussion instrument as well as playing the harmonica. As part of our work on the Caribbean, we have been drawing Caribbean flowers. We have used chalk pastels and colouring pencils so that we can decide which medium is best. We will then use these drawings to design a print. This week we have been reading Caribbean poetry by Valerie Bloom. We explored the rhythm and looked at each line for rhyme and alliteration. This week we have been creating our own maps of our walk to school. We have created a key that will enable someone to understand and use the map. Also we have thought about the use of colour to make the route clear. This week we have been plotting Darwin’s voyage using atlases. We looked up the place in the index and then used the co-ordinates to find it in the atlas. We then plotted it on our own maps. We found that Darwin travelled around the coast of South America and Australia, stopping off at different islands on the way. The children have been working really hard at making their robot models. They have tried different ways of attaching the parts together until they found a successful way of joining. Now that they have made the model’s shape they will cover it and paint it. The children have taken these photos on our class iPad. As part of our Iron Man topic we have being looking at how animals move. We have learnt about how bones and muscles work together to allow us to move. To help use explore this we made models of the arm bones and muscles. As part of challenge week, we have used what we have learnt about electrical circuits to create a switch that would catch Father Christmas. We thought about what a switch is and what type of switch would be most effective. These are some of our designs. Year 4 have been celebrating Shakespeare as part of World Book Day by learning about A midsummer Night's Dream.